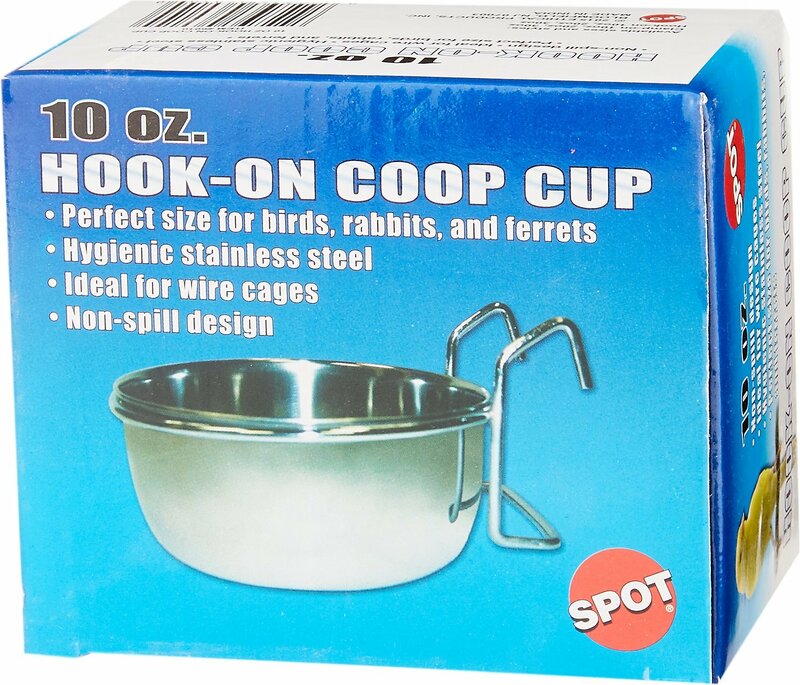 The Ethical Pet Stainless Steel Coop Cup Wire Hanger Bowl is a clean, spill free way to feed dogs, cats and birds. Wire hanging bracket easily attaches to bird cages, dog crates and chain link fences. Was very excited to get this for a momma cat that I was fostering with her babies. I thought it would be smarter and they would have more room to move in the kennel. Well there wasn’t a day I wasn’t cleaning up the mess. It’s a very small bowl and can’t hold much food or water. For an adult animal it tips easily and makes a mess. They should consider clips or something to have it sit more secure. Inexpensive, and sadly it shows. I was very excited to open the boxes and use these immediately! The first box I opened, I quickly rinsed it out and put food in it and I put it in my dogs pen and it fit well! I opened the second box, rinsed it, put water in it, put it in my dogs pen and water spilled everywhere! The hooks on the second bowl wasn't bent well. I had to get pliers to make it align with the other side, after that it has worked perfectly ! Great buy, other than the defect one of the items came with!!! I found it difficult to find the kind of bowl that would attach easily to a wire crate and be as easily removable. 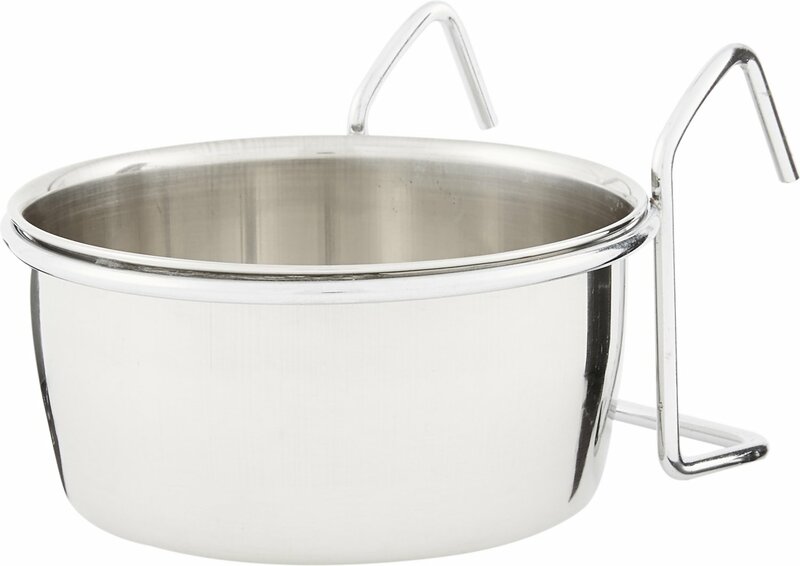 This is a nice, light-weight bowl that will work for my puppy until she grows to a mid-size dog. Very good price, too. This little bowl does it's job. Very convenient and easy bowl to put food or water in a crate or travel kennel. Easy to put on and take off. Pretty sturdy as far as staying in place with an aggressively playful pup in the kennel (though I'd recommend getting one that mounts more permanently to the door for them.) Bowl can separate from holder so you can take it along in a backpack for water at the park if you desire. Satisfied buyer. I got 2 of these for a cat cage for water and dry food. Kitty has managed to spill them. I bent the hangers down as best as I could and that has helped a bit. Hanger part is sturdy but the removable cup part is pretty lightweight and I hope it doesn't rust. Overall it's just OK. I got these to go in my Frisco dog Crate but they are not a good fit. I would get the ones that clamp to the side of the crate. I will still use them though. I will put them in my rabbit hutches to give them treats. Still a good product. Our beagle needs to be created when we're not at home, and leaving her some water - that she can't spill! puts my mind at ease. This bowl is the perfect size, we fill it half-way, and have yet to have an accident in the crate. She can rest comfortably with some treats, and wash 'em down with water while we're gone. These bowls are awesome I have 2 in each crate side by side for filtered water n for their dog food. I feed them in their crates so there’s never an issue of who’s is what. Best bowls ever 30oz.